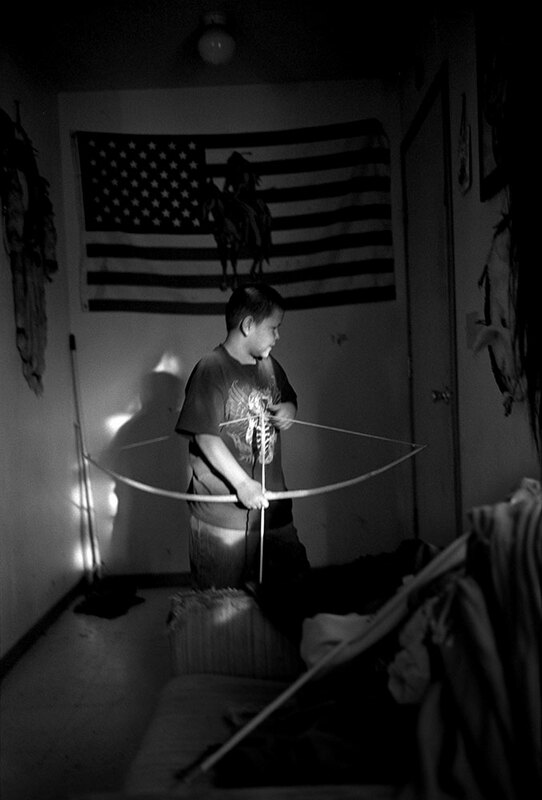 Jay Waters holds a traditional bow and arrow on the Pine Ridge Reservation in South Dakota. Jay’s father, John Waters, works to teach his children Lakota traditions, including the language. The Waters family, known on the reservation as traditionalists, are active in efforts to preserve Lakota culture. • How would you describe what is occurring in this photograph? • What strikes you about the composition of this image? Why? • In the caption, photographer Danny Wilcox Frazier notes that young Jay Waters’s father, John, is part of a larger movement to teach and preserve Lakota language and tradition. How does this image speak to this larger movement? What aspects of the image reinforce these ideas?